One of the biggest trends we're seeing right now has luxury travel companies offering time-sensitive promos, with deep discounts available...but only during a limited booking window. EliteTravelGal thinks it's a pretty wise move, as what better way to stimulate advance bookings than to offer early-booking savings? So...if you've gotten into the habit of waiting til the last minute to see what kind of deals you can grab, change your thinking and start planning that summer vacay as the deals won't get better than those offered far in advance. For example, Seabourn just announced a 60 percent savings on dozens of amazing Mediterranean sailings between March 31 and August 29. The catch? Bookings must be made Monday Jan 12 through Monday Jan 19th. Per person fares from about $2,800, depending on date and itinerary. If you book a select sailing to Alaska aboard Celebrity by this Friday,Jan. 9th, you'll get a $200 shipboard credit and only 50 percent of the typical deposit is required. 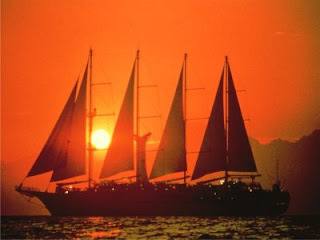 For its part, Windstar (pictured above) is also offering a 50 percent reduction on cruise deposits on all new bookings made now through Feb. 28. This means a committment of only $375/person instead of $750 each, within 3 days of putting a cabin on hold. Check back with us often for more time-sensitive deals as they appear to be one of the first hot trends in luxury travel for 2009. Click here to contact The EliteTravelGal for more information on these and other luxury vacation ideas.